Get ready for one final string of awesome announcements. During their Nintendo Direct presentation last month, Nintendo announced that they would be holding one last, final presentation for Super Smash Bros. in December. Now we know when that will be- it will be broadcast worldwide on December 15. Nintendo has held an entire series of Direct presentations held solely for Super Smash Bros.- this final one promises to be an eventful one, with Cloud’s inclusion in Smash Bros. being elaborated upon, at the very least, as well as us getting the long overdue announcement of the results of the Smash Ballot. 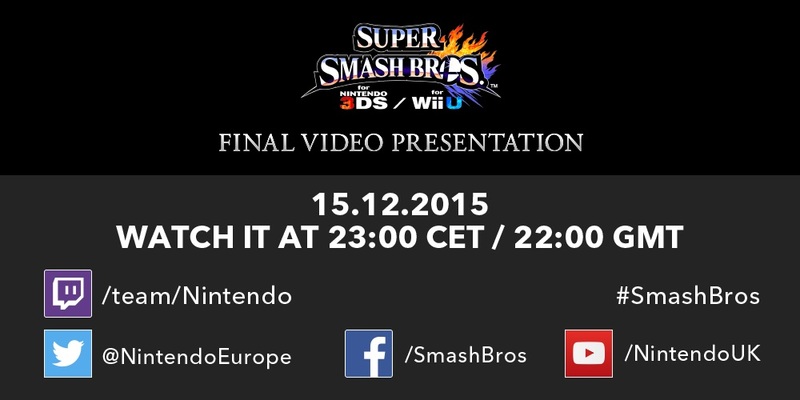 Notably, this being the final Smash Bros. Direct does not imply the end of post launch support for the game- we can probably expect Nintendo to continue supporting Super Smash Bros. with updates for a while now, especially if they plan on keeping the competitive community alive. You can tune in on to the broadcast December 15 at 2pm PT/5pm ET/10pm UK. Stay tuned to GamingBolt, too, because we’ll keep you posted.